Create an office space that exudes classic elegance with this transitional writing desk. The desk offers two drawers in its right and left pedestals, with a center drawer fit for a keyboard or writing utensils. 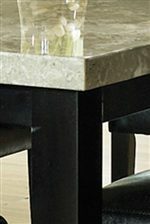 A rich brown finish gives the piece a chic appearance, while the white marble top adds an elegant and luxurious touch. Tapered legs extending from the pedestals complete the look, for a silhouette that recalls traditional double pedestal desks without the bulk. Chic and sophisticated, the white marble writing desk is the perfect piece to give your home office space an executive feel. The Monarch 5 Drawer Writing Desk with White Marble Top by Steve Silver at Walker's Furniture in the Spokane, Kennewick, Tri-Cities, Wenatchee, Coeur D’Alene, Yakima, Walla Walla, Umatilla, Moses Lake area. Product availability may vary. Contact us for the most current availability on this product. Case Detail Back chair legs are framed into the chair backs providing a more stable chair. Case Construction Heavy framed panel sides on cases. Raised panel door fronts. 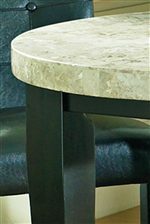 With its rich looking marble veneer tops contrasting with the black framing, the Monarch collection offers a stunning look for your dining and home office needs. The five versatile dining and counter height sets allow you to bring this look to your formal dining, or use in smaller areas such as your porch or or sun room. 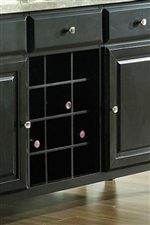 Entertaining will be fun with the wine rack - server featuring a twelve bottle wine rack in the center. A marble-topped writing desk and coordinating side chair bring classic sophistication to any home office space. Complete your home with the matching occasional tables. 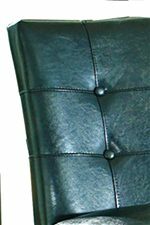 The Monarch collection is a great option if you are looking for Contemporary furniture in the Spokane, Kennewick, Tri-Cities, Wenatchee, Coeur D’Alene, Yakima, Walla Walla, Umatilla, Moses Lake area. Browse other items in the Monarch collection from Walker's Furniture in the Spokane, Kennewick, Tri-Cities, Wenatchee, Coeur D’Alene, Yakima, Walla Walla, Umatilla, Moses Lake area.